Let's try to list all the best current brake part choices we can in a single thread, I think it would be very helpful! I'm going to be replacing my brakes soon, and I'd like to get some feel for what type of equipment everyone is running and how it's working out. I think we'd all like more stopping power out of our PFs, but budget and other concerns can sometimes force certain compromises. Also, some require a very quiet and dust-free pad while others will happily put up with extra dust and a bit of squeal for extra performance. Different needs, price points, etc., all welcome. Let's hear about some experience on and offroad with different stuff. I just did the pads about an hour ago, and drove about 50 km. World of difference, but I'm not surprised based on the level of wear on the old ones. Took off what appeared to be oem nossan pads, and swapped for premium oe ceramics from napa. Just under $200 cdn for front and back ($120 - front, $80 - rear). Haven't put too many miles on uet like I said, but so far so good. Stopping power is great. Little bit of noise, but that'll go away after a run down the highway. I put these on about 5k-10k miles ago. Only difference I've noticed is if I slam on the brakes the truck stops a little quicker. For daily driving, not really a big difference. If anything, they look cool on there. I am going to get the Goodridge brake lines though, but in due time. So, the only change you made was the pads? No new or resurfaced rotors or anything? Great that you've noticed an increase in stopping power. How worn were the old ones? Yeah, they definitely look cool! More emergency braking power seems to be what I need most. Regular on- or offroad driving doesn't seem to tax my brakes too much. Trying to stop quickly from speed is a different story, as the PF seems to always go further than it should. Come to think of it, it's almost a bit like the brakes 'fade' at the end of a stop from speed, for lack of a better term. I have replaced my fluid with ATE Typ 200 Dot 4. What made you choose the Goodridge stainless lines for your future mod over others? Looked at the Goodridge lines only because there were the only ones I could find to be honest. Seems most people who have SS lines have the Goodridge on here. Not sure what the general consensus is for those that have them, but then again I've put a minimal amount of effort searching. Regarding emergency stopping power, that's the main reason for buying them. Ended up having to slam on the brakes with the stock setup and rear ended someone. The tires didn't really skid (Cooper HTP), which led me to the conclusion that the brakes just didn't have enough bite. This was from about 45-ish MPH. Granted this isn't a 370Z and it obviously weighs more, so stopping distance is gonna be a bit longer. The car in front of me was an older Audi S4, so yeah, it stopped a lot quicker than I did. I will say though that I've played around with just slamming on the brakes for grins and can report there is no fade. In time I'll get the lines put on and new brake fluid put in and I expect to get the most from the stock calipers. Dealer wanted $140 for the brake fluid change which I might take them up on. They do send me the occasional 20% off services every time there is a holiday and it's almost Memorial Day here in the States. Ok, so I found some other brake lines that fit. They are the Techna Fit brand. http://www.technafitstore.com/NISSAN-BRAKE-LINE-KIT-p/nis-2210.htm. So I picked them up and plan on installing these possibly next weekend. What I wanted to ask is if there are any caveats that I need to watch out for or parts that should be replaced and not reused? I ask just so I can hit up the parts dept and buy any washers/etc that may be needed. Also any suggestions for a brake fluid flush on type of fluid or methods/tools? Next time I replace my front brakes, I'm swapping them with V8 parts, which have a rotor that is about 1" larger in diameter. All you need is the pads, calipers with mounting brackets and rotors to fit a 2008-2012 V8 Pathfinder and they'll bolt right on. The brake hoses and master cylinder are the same. Make sure you have at least 17" wheels. Wish I had known about that, I just replaced my fronts a few months ago. I DO NOT recommend Powerstop brakes (z16). 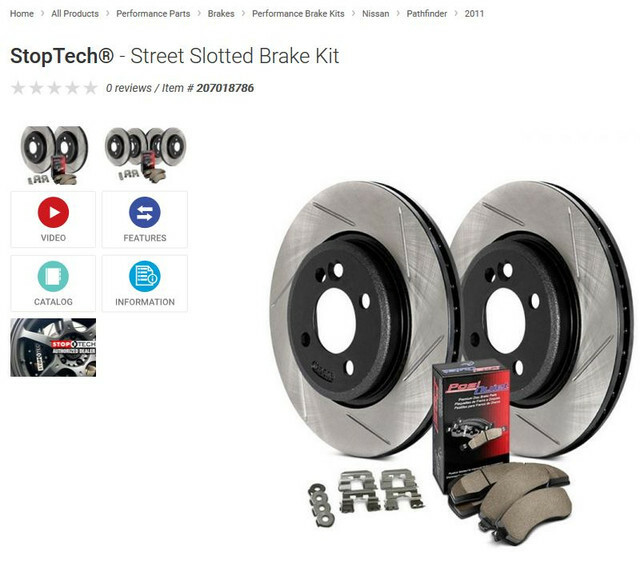 I bought the complete front set with calipers because my calipers needed a rebuild, and while the set looked good and I did a lot of research beforehand, the stopping power is really bad. Im doing the rears this weekend, I bought Akebono ProAct pads and Brembo coated rotors. Question for the brake pro's: if I want to replace the front pads with better pads now, can I do that without having to resurface the rotors? I have tried to figure out if I can just swap the front pads since there are only about 1000 miles on the new rotors, but I'm worried about how the "bed-in" process would go. Just swap the pads and break them in as you normally would. The rotors will be fine. Thanks, will give that a try! The Akebono ProAct with Brembo coated rotors in the back feel great. Also installed goodridge SS lines. Only thing I wish I did differently was get the next level up of the Akebono pads, the performance version. Im going to swap the fronts for those. There are just way too many brake pads out there in the market. On my Titan I have frozen rotors (slotted) with Hawk LTS pads and they are amazing, but it was $1000 for the set of 4!